While some SUVs have off-road looks, but limited ability when the going gets rough the Toyota Land Cruiser backs up its tough styling with awesome cross-country abilities. From its beginnings in 1951 as a mobility vehicle for Japan’s National Police Reserve, and then through sixty years of continuous production, fourteen model lines and thousands of variations, the Land Cruiser is the longest produced vehicle in Toyota’s history. This latest version has been developed with the same close focus on capability as its predecessors. Prototype models were subjected nearly 20,000 miles driving over the most severe terrain on the off-road test course at Toyota’s Tahara factory in Japan, which is twice the distance covered in regular off-road vehicle testing, and the equivalent of tens of thousands of miles of everyday use. An SUV designed to tackle truly tough off-road terrain has to have a generous ground clearance. This is not just about the distance between the lowest point of the vehicle body and the ground: there are three other measurements that dictate the quality of off-road ability: the approach angle, ramp breakover angle and departure angle. In this short guide to the car, we help describe what this means, and why it’s important. The five-door Land Cruiser has a minimum ground clearance of 215mm. The approach angle, which determines the maximum gradient the vehicle can approach without the underside of the front bumper hitting the ground, is 32°. The ramp breakover angle (measured from the centre of the underbody to the contact points of the front and rear tyres), which determines the gradient the vehicle can crest without the ground contacting the underbody, is 22°. the departure angle, which governs the maximum gradient the vehicle can negotiate without the underside of the rear bumper hitting the ground, is 25°, or 24° on models equipped with air suspension. Land Cruiser can also be driven at a maximum bank angle of 42° and at a maximum forward or reverse pitch angle of 42°. Especially important at this time of year, its maximum wading depth is 700mm. The four-wheel drive system also has a new rear differential, designed for greater reliability and strength. An additional rear diff lock is fitted to Invincible models, increasing stability and grip in extreme off-road conditions. Multi-terrain Select is an evolution of the Land Cruiser’s A-TRC traction control system and a Toyota first. Multi-terrain Select (MTS) automatically modifies vehicle acceleration, braking and traction control to suit the off-road conditions, providing the driver with optimum traction and vehicle control. The Land Cruiser’s MTS set up offers four terrain modes: Mud and Sand, Loose Rock, Mogul and Rock. Drivers should choose an MTS mode on the basis of the amount of wheelspin encountered. For example, when excessive wheelspin prevents the vehicle from gaining enough traction, a more aggressive mode, closer to the Rock setting, should be selected. Conversely, when there is too little wheelspin to achieve the necessary traction, a less aggressive setting, closer to Mud and Sand is recommended. Crawl Control, another standard feature of the Land Cruiser Invincible, can help the driver climb or descend slopes at walking pace, or free the vehicle when stuck, without having to touch the pedals. The system automatically controls the engine and brakes to maintain the desired speed. With no need for careful use of the throttle or brake pedals, the driver can concentrate on steering the vehicle. The multi-terrain ABS system fitted to Land Cruiser has been calibrated to give remarkable stopping power across a wide range of off-road surfaces. While the system prevents the wheels from locking under braking on Tarmac roads in the same way as a conventional ABS, it deliberately allows for a certain degree of wheel-locking on loose surfaces, helping the tyres find purchase by digging in, so increasing stopping power. Hill-start Control and Downhill Assist Control are fitted to both Active and Icon grades (the Invincible covers these functions with Crawl Control). Hill-start Control detects any backward slip of the vehicle during an uphill start and temporarily applies the brakes to all four wheels for a maximum five seconds, allowing the driver to pull away without losing control. Downhill Assist Control automatically governs vehicle speed to prevent the Land Cruiser from running downhill out of control. It works at speed less than 15mph, with no need for the driver to use the brake and accelerator pedals. Forward speed is controlled to between 3 and 4mph; reverse speed to between 1 and 3mph. 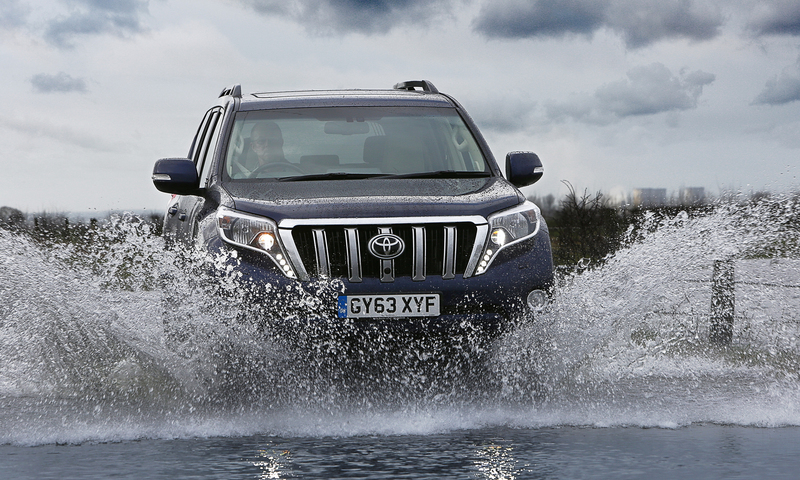 For more information of the 2014 Land Cruiser visit the dedicated section on the Toyota website.